Silicone Cleaning Spinneret Spray | DT Group Ltd.
Our Cleaning Spinneret Spray is a propriety aerosol product having High Viscosity Silicone Oil as its primary ingredient. The main feature of the Silicone oil used in the product is its thermal stability and resistance to oxidation and charring in exposed conditions at high temperatures (exceeding 300’C). The Silicone Oil forms a thin film on the spinneret surface, and maintains its effect for a long duration due to its heat stability and low volatility. 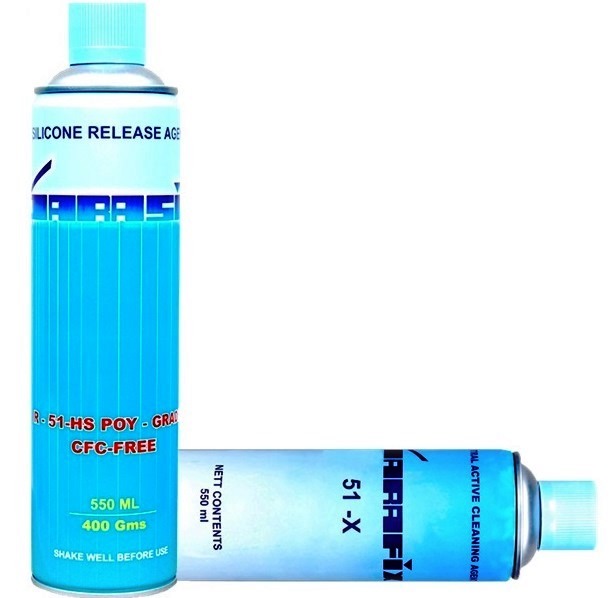 The heat stable silicone oil is used in conjunction with non toxic and non flammable solvents to impart mobility to the viscous silicone fluid. The multi effect of the combination of solvents is the dispersion of silicon oil molecule to form a thin uniform film on the spinnerets surface, and to enhance the spread ability of the silicone oil while applying and cleaning the spinneret surface. Another important role of the solvents used in our spray is to clean the surface and fine holes of the spinnerets by penetrating inside and removing the greasy film of oligomers and burnt polymers. The solvents, being highly volatile liquids. And it get evaporated leaving a thin uniform film of silicone oil inside the holes and surface of spinnerets only. The role of gases (known as Propellants) in our spray is dual purpose. The main purpose of the propellants is to discharge the liquid mixture from the pressurized aerosol container in the form of fine spray or mist. This process is known as atomization. And it helps deposit the product on the spinneret. Secondly, the deodorized Hydrocarbon or Fluorocarbon based Propellants are good solvents for silicone oil and also serve as effective degreasers and cleaners and help in cleaning the spinneret surface and holes. While there is no important and initial role of viscosity of silicone fluids in the performance while being used on spinneret, the viscosity temperature coefficient is a very important parameter and determines the quality of silicone oil and performance at temperatures in excess of 300‘C. Our spray uses a superior grade of silicone oil that has a viscosity temperature coefficient which maintains even viscosity at high temperatures during application, hence maintaining the lubricity. The most critical property of silicone oil used in our spray. It is the stability of the oil at high temperatures in open exposed conditions. Typically, high temperature and presence of air cause oxidation and gelation of silicone oil making it effective only for a very short duration, hence, making the product ineffective. Our spray uses highly heat stable silicone oil maintaining the liquid state of oil, even at high temperatures in excess of 300‘C for up to 96 hours. Heater Cleaning Spray is a highly active neutral cleaning agent in the aerosol form. The neutral active foam of this spray, removes all kinds of deposits from the surface of primary heaters on Texturizing Machines, and Godets on Spinning Machines. The overall cleaning process is free from any surface particles ensuring no possibility of any physical damage to the delicate heater and godet surface. The active foam of this cleaning spray, can also be used on Nitrated Heater Surfaces. 51X is primarily for room temperature applications or a maximum of 700C on hot surfaces. 51X – HT is an adapted version with unique properties enabling use at high temperatures (up to 2000C). This allows for use on running machines without reducing heater temperature and hence, ensuring no production loss during the cleaning process.